Wes Peterson was born December 28, 1932 in the midst of a typhoid epidemic in Chamberlain, SD. Records show that during that epidemic his was the only case where both mother and baby survived. He spent most of his growing-up years in Sioux Falls, SD. Wes was the oldest child of Norman Peterson and Ethel Schuttler Peterson. Soon a younger brother, Perry, was added to the family followed by two sisters, Karen and Normalie. Perry was only 13 months younger and they shared many coming-of-age experiences. Their first bicycle was shared as was their first car. That car was no ordinary car. It was a 1936 Oldsmobile which the two boys painted green and then plastered the body with slogans in red and yellow lettering. On one side of the hood was painted, “opportunity, hear it knock,” the other side read “heap big smoke, no fire.” Once it actually had an electrical fire under the hood, adding authentic paint blisters to the words. A few other phrases were: “don’t laugh, lady, your daughter may be inside”; “any contributions gratefully accepted” with an arrow pointing to the gas tank; “we may be slow but we’re still ahead of you.” The car’s name was Irene, and the back of the car was painted with “Good Night, Irene” after a song popular at the time. In the fall of 1951 the family moved to Lincoln Nebraska where Wes enrolled at Union College. One of the overarching themes in Wes’ life was his curiosity, and openness to new experiences. This is reflected in the many types of part-time work he engaged in throughout his life. The next spring he went to work at a ranch in the Black Hills allowing him to truthfully add “cowboy” to a resume that would also include such occupations as Alaska salmon fisherman, lumberjack, long-haul truck driver, construction worker, Army medic, teacher, pastor, and hospital chaplain, and providing him with a seemingly endless repertoire of stories with which he entertained family and friends. When he returned from the Black Hills that fall, he discovered that his sister had found a new friend, Lois Hoyt. It didn’t take him long to decide that he also liked Karen’s friend. The following April found him heading for Basic Military Training. Upon returning home on leave, he began seriously discussing the future with Lois, and in December they were married. 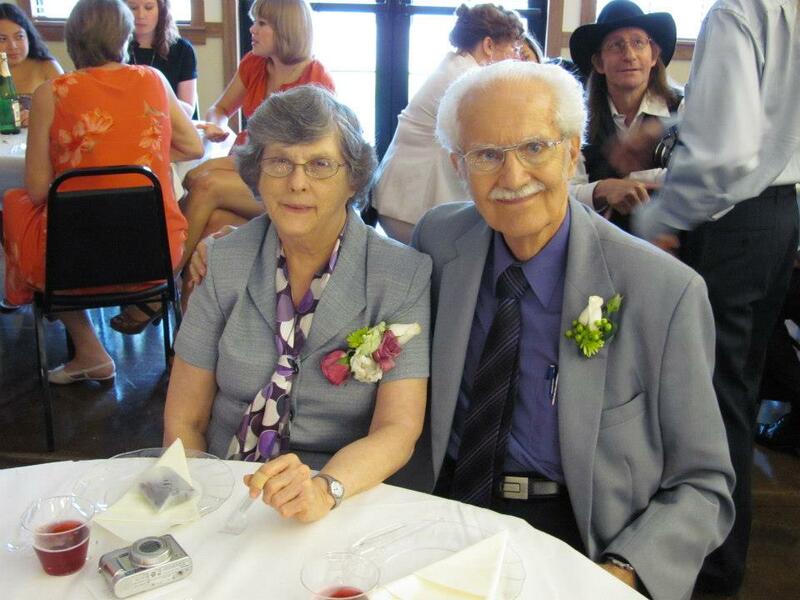 The bond between the Peterson and the Hoyt clans was further cemented when his brother Perry married Lois’ niece Valeta making Wes his brother’s uncle. Wes used to joke that the family was working on “I’m my own grandpa” but had not quite figured out how to achieve this particular innovation. One of the years of Wes’ military service was spent in Germany. He took full advantage of his time in Europe and spent his leave time exploring the environs traveling by bicycle. His explorations took him as far as his ancestral town in Denmark. Throughout his life Wes was known for a broad sense of humor and a propensity for pranks. One representative army story that illustrates this involves conspiring with another Peterson, who resided in the opposite end of the same barracks, to cover for each other’s fairly frequent, unauthorized absences. The procedure involved calling out “present” when the sergeant called out “Peterson” during evening roll call, bailing out the window, running to the other end of the barracks, and climbing through the window to report “present” at the other end. I could recount other similar stories, but if I did, we would be here all day. After military service, it was back to finish his education at Union College. But before completing his senior year he had to interrupt his education because of the need to support his growing family. Kristine joined the family in 1957 followed by Linnaea in 1960. In searching for work, he found that an elementary school in Colorado was desperately in need of a teacher. He eagerly took the job, which launched his career in education. Eric joined the family in 1963, followed by Ingrid in 1964. During these years in addition to teaching full-time and taking on additional work during the summer months, Wes was also in school. He completed his Bachelor’s degree from Colorado State University in 1965. In 1966 he was invited to return to Union College in Lincoln, NE to assume the role of elementary school teacher and supervisor of student teachers along with teaching summer education classes at the College. He enjoyed the classroom, and the chairman of the Education Department at Union College referred to Wes as a Master Teacher. He completed a Master of Education degree at the University of Nebraska in 1969. 1972 found the family traveling to Africa where Wes taught at Kamagamgo Teachers College in Kenya. Serious episodes of malaria made it advisable to make a change, and the family was transferred to Beirut, Lebanon to teach in the Beirut Overseas School. When fighting broke out in Beirut in 1975, the entire school was evacuated to Cyprus. After attempting to “wait out” the fighting in Lebanon for nearly a year, Wes concluded that the conflict was more serious than the recent history of sporadic sectarian clashes, and was unlikely to “blow over.” He made the decision to move his family back to the United States during the summer of 1976. After an initial year of classroom teaching in Southeast Massachusetts, Wes and family moved to Denver where he was Associate Superintendent of Schools for the Rocky Mountain Conference of SDA, traveling throughout Colorado and Wyoming, visiting the schools and assisting the teachers. In 1982, Wes was ordained to the Gospel Ministry in the Seventh-day Adventist Church. In 1985 he was asked to become Superintendent of Schools for the Minnesota Conference of Seventh-day Adventists. After two years in Minnesota, Wes received a call to serve as principal of Maxwell Adventist Academy in Kenya, a 12-grade boarding school in English for missionaries’ children. The school had recently been moved from the center of Nairobi to a new rural location. The campus was still under construction, making it a pioneering effort. In the beginning, the dormitories and staff housing were merely long quonset huts partitioned as needed. General health concerns made it advisable to return to the States in 1989. Back home he resumed teaching a few more years until he moved into a pastoring role in Iowa, with a district of 3 churches in the greater Des Moines area. Retirement came in 1998, after 40 years of service in various roles, but in his retirement he continued part-time responsibilities as superintendent of Education for the Dakota Conference of SDA for a couple years. Moving to Sturgeon, MO brought new opportunities for service at Moberly Regional Medical Center where he served in a chaplain’s role and supervised the training of volunteers. In reflecting on the various roles that Wes played in his life, the role of teacher is that one that is probably most strongly identified with him. He spent 19 of the 40 years in direct classroom teaching before transitioning into administrative roles. He taught a range of topics at every level from K through 12 and taught teaching methods at the college level. He was acknowledged as a Master Teacher and inspired generations of students to embrace a love of learning. He especially enjoyed teaching history and had a knack for making it come alive. As an example, Eric recalls that he led a family discussion of the origins of World War I as the family was traveling through Sarajevo during one of the its famous road trips. While involved in Ministry, he especially excelled in the teaching and preaching roles. Wes’ openness to new experiences has already been mentioned, and it expressed itself in a love of travel with a bent towards adventure. This was reflected in two stints of overseas service and extensive travel in Europe, Africa, the Middle East, Southeast Asia, and Australia. He was an avid photographer, a hobby that went well with the love of travel. He was also a gifted writer and used this gift to very practical ends. Most of you have no doubt read his articles in various newsletters and denominational periodicals. Wes was also a man of faith who did not fail to commend the faith that was within him to his family, friends, and associates. He passed on his many gifts in differing ways to his children. Kris inherited his vocation of teaching, his voluble and gregarious personality and his creativity. Linnaea inherited his superb organizational skills. Eric inherited his intellectual curiosity, and Ingrid inherited in equal parts his sanguine personality and his practical abilities. Wes was very proud of his children and considered them to be his greatest legacy. Wes was happiest when could be active and felt useful, so the past two years of ill health were especially difficult for him. Nevertheless he was able to find a ministry of presence and encouragement among the staff and residents of the Loma Linda Healthcare facility. The final chapter of Wes’ life was written this past week when he suffered a medical crisis severe enough to summon the whole family to his side. After staging a rally that allowed him to spend some precious time with his family, it became clear that his body was too weak to sustain a recovery, and on Monday evening he slipped away gazing into the eyes of Lois while surrounded and comforted by his family. Mr. Peterson was the coolest principal. He understood us boys at Maxwell Adventist Academy and was like a father to us. He made a huge, huge impact in the lives of each of us. I can still remember the time he caught a whole bunch of us guys running around in the bush at night playing hide-n-seek. We thought we were in for a huge lecture and punishment. We did get the lecture about safety…but instead, he joined us that night and told us whenever we planned to do it again, to let him know so we would make sure the Masaai guards were aware of our games. Mr. Peterson will be missed. My condolences to Mrs. Peterson and the whole family.